GRD Iyers GuruCool strongly believes in forming quality alliances with other well-established spiritual organizations, who are inclusive, encourage and support women in the study of Sanatana Dharma scriptures. Our sincere efforts have borne fruit and we are delighted to share the results with you. We are fortunate that we were able to meet Sri Haran Ayya of Sri Vidya Temple Society (SVTS), during the Sahasra Chandi 2015 held in Mississauga, ON, Canada. He was really impressed by the chanting of all the Ritwiks, who were from GRD Iyers GuruCool. Subsequently, he invited us for taking part in a Sahasra Linga puja on Maha Shiva Ratri day in 2016. Then onwards, we have become really close to him and the Sri Vidya temple. We taught Devi Mahatmyam at the temple and today more than 150 devotees of the temple chant Devi Mahatmyam fluently – and the numbers are still growing. In August 2017, SVTS performed a grand Shata Chandi in which all the students “graduated”. This was followed by a spectacular Sahasra Chandi in Navaratri in Sept 2017, where Sri Haran Ayya kindly appointed me as the Pradhana Acharya or Chief Priest. It was a rare honour indeed. The event was a great success and today, Devi Mahatmyam has come to stay at SVTS. Sri Haran Ayya has declared that a Shata Chandi or Sahasra Chandi will be performed every year at the temple! This was all possible due to the high spiritual nature of the alliance formed between GRD Iyers GuruCool and SVTS. Sri Haran Ayya has kindly made available their LIVESTREAM streaming facility which are being used in parallel with our USTREAM streaming facility. A grand Maha Rudram is being planned during the long weekend in March 2017, where SVTS and GRD Iyers GuruCool will come together again and include one and all, who are spiritually inclined, to participate in this Maha Yagna. Mahanyasam and Rudra Krama Patham will be chanted by the students. By next year, the students will be ready to chant Rudra Ghanam too! Sri Haran Ayya continues to be our mentor and is always available to support and provide his valuable guidance. He is a treasure of knowledge and an embodiment of kindness and love. We consider ourselves extremely fortunate to get his blessings in so many ways. We will endeavour to contribute what little we can to SVTS and his plans for building a magnificent granite temple in Rochester, NY. In the summer of 2017, we were invited by senior representatives of SMVA, Canada, to perform a homam, in the presence of Sri Amma Karunamayi. This was a great honour and a serious responsibility. 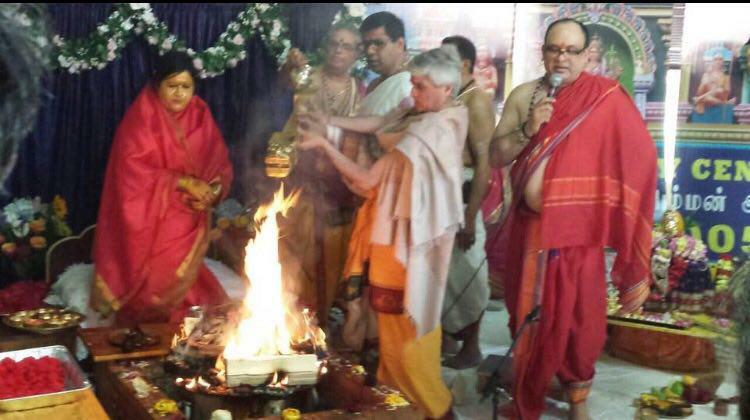 The actual homam would be performed by Amma while the mantra recitation would be responsibility of GRD Iyers GuruCool. The experience was an unforgettable one, with great vibrations. A huge crowd had gathered at the temple. A grand 5 hour homam was performed. At the end of the homam, Amma beamed and smilingly announced on the mike that “Son, this is the best homam we have done for this year!” Coming from her, we consider it a great blessing! Subsequently, we chanted Sri Rudram in the evening as Amma performed Annabhisekham to a beautiful Shiva Lingam. We were again amazed when Amma took the mike and smilingly announced that she felt immense peace and disclosed that she had felt a certain restlessness during her North America tour but she felt harmony and calmness at the end our recitation. We could not believe our ears. Our sincere chanting effort had been recognized and acknowledged by such a noble soul! We felt truly humbled. We are pleased to announce that Amma’s 60th Birthday is being celebrated in 2018 with the performance of a grand Maha Rudram and Shata Chandi by GRD Iyers GuruCool in association with SMVA, Canada. Our team will provide the technical expertise and lead all the mantra recitation and homams, while SMVA will provide other required support. A usual Maha Rudram or Shata Chanda would each take 3 days to be performed, while we are planning to deliver both mega events in only 2 days! All this is possible only because of our inclusive approach that is bringing great spiritual leaders in our lives which is lending a huge boost to our efforts. A couple of our students are ardent followers of Sri Sathya Sai Baba and they suggested that our team should perform a Rudra Ekadashi. Subsequently, their efforts bore fruit, and our team performed successive Rudra Ekadashis at 2 Sri Sathya Sai Centres – at Etobicoke IYork Center) and Scarborough. Then on Women’s Day observed by Sri Sathya Sai Center at Scarborough, our team’s lady members delivered a “Ladies Only” rendition of Sri Rudram at the Centre to the amazement of all onlookers. The outcome of these efforts was that we have been invited by Sri Sathya Sai Centre, York Center, to teach Sri Rudram to their devotees. We are commencing classes on January-12,2018 at the Center and the Audio of the classes will be broadcast live at the link below. With the blessings of Sri Sathya Sai Baba, we are confident that Baba’s devotees will successfully learn Sri Rudram and recite the same during their prayer time and during all their spiritual events. Sri Sathya Sai Baba had encouraged everyone to learn Sri Rudram, as it is a universal Vedic hymn, and the passion and dedication of his devotees in following his guidance is truly inspiring!